After winning the much-coveted Champion Hurdle in 2015, Faugheen was touted by many as the next big star. An imperious display of pace, jumping, and race management – the Mullins trained superstar had plenty left in the tank as he romped to success in the Cheltenham Festival classic. With just one blemish from then until December 2017 in Leopardstown to his name (a second-place finish to Nichols Canyon in the Stan James Hurdle at Punchestown), the tipsters over at Turfoo France believed that the Champion Hurdle at Cheltenham was well within his sights again – despite being out for well over a year with an injury. Little did they know what was going to happen over the next four races. The Leopardstown Ryanair Hurdle was to prove the first in a string of three failures over the 2-mile distance. After being pulled up here, Mullins sent Faugheen back there in February where he finished second to an excellent display from Supasundae. This was followed up by an extremely unimpressive 6th placed finish in the Cheltenham Champion Hurdle, and many punters thought that the once feared 2 miler was going to be retired. So, Ricci chucked him in for what can only be called his ‘last chance saloon’. 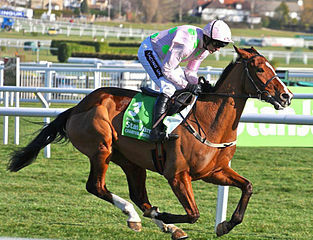 Roll on 26th April at Punchestown – a date that a year ago, nobody had dreamt they’d seen Faugheen appearing at. Mullins’ last crack of the whip for his superstar was to chance his arm over 3 miles in the Stayers Hurdle. And how David Mullin’s mount responded in the formidable pink and green colours – Faugheen hacked up over the longer distance and left horse racing enthusiasts around the world wondering just how the Ricci-Mullins-Mullins trio had managed to pull it off. But in reality, it was a phenomenal display. He took off and made all, and it was a tactic that paid dividends. It was so impressive, that Faugheen had an advantage of over 13 lengths over favourite Shaneshill when he crossed the line. An imperious display of hunger, appetite and leading from the front. So, just where is this 10-year-old destined for over the 2019 season? Nobody knows the intentions of trainer Willie Mullins, but punters will be backing him to end up at the Stayers Hurdle at the Cheltenham Festival in the coming months. And if he turns up at anywhere near the level he did when he destroyed Shaneshill by over 13 lengths, then who would bet against punters lining their pockets as a result of Faugheen proving his class over the longer trip of 3 miles again. He’s since had surgery to remove a huge lump from his groin area, which may give suitable explanation as to his dip in form over 2 miles. At the time of writing, the shortest priced being offered on Faugheen winning the Stayers Hurdle at the Cheltenham Festival is just 3/1. Penhill, Supasundae, and maybe even Apple’s Jade may have something to say about that. But who would bet against one of the greats of the game coming up trumps again?